Sounds pretty impressive doesn't it? "Our observations of the first reported outburst of SDSS J081321.91+452809.4 during 2008 April show that this cataclysmic variable is a dwarf nova. The outburst amplitude was at least 3.1 magnitudes and the outburst appears to have been rather short-lived at around 3 days with a rapid decline to quiescence of 0.73 mag/day." Jeremy and Ian are members of the British Astronomical Association Variable Star Section (BAAVSS), and Steve is a member of the AAVSO, the American Association of Variable Star Observers. SDSS J081321.91+452809.4 is a cataclysmic variable discovered by the Sloan Digital Sky Survey (SDSS) and its epoch 2000 coordinates are 081321.91+452809.4. Hence, the long name. We'll call it SDSS 0813 from here on. 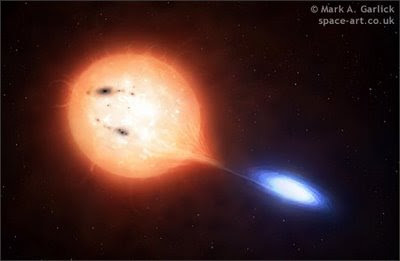 Cataclysmic variables (CVs) are close binaries containing a white dwarf primary and a late-type secondary star. The secondary ﬁlls its Roche-lobe and transfers gas to the primary, so that an accretion disk is formed. Image used with permission by Mark A. Garlick. Do not use without permission. Most CVs are prone to outbursts, where the system brightens by several magnitudes at irregular intervals. No one can predict when a CV will go into outburst next, so monitoring them for these variations is not only scientifically interesting, its fun and exciting. Some CVs go off very couple weeks, others may take 20 or 30 years to build up enough material in the accretion disk to create the instability to trigger an outburst. Since its discovery, SDSS 0813 had not been observed in outburst. The orbital period of the binary pair had been determined spectroscopically, and it is on the long side for CVs, above what is known as the period gap. SDSS 0813 was detected in outburst for the first time on April 6, 2008 by Miller as part of a campaign by the authors to monitor this CV for possible outbursts. The comparison star sequence and chart used to observe this CV were published by me in 2002. So I actually had a small hand in assisting in the acquisition and calibration of the observations. The CV was detected in outburst at magnitude 15.3, but the actual beginning and maximum brightness of the outburst may have been missed. The system faded quite rapidly, sinking back down to magnitude 17.3 after only three days. The short outburst time, lack of superhumps, which would have indicated it was a UGSU type CV, and the longish period, lead the authors to conclude that this a dwarf nova of the UGSS type. Since this star is newly discovered and classified, there is still plenty to do. Further observations of SDSS 0813 are encouraged to investigate the outburst frequency, outburst amplitude and whether the dwarf nova undergoes frequent brief outbursts, like some other unusual CVs of this type. Is this ground breaking astrophysics? No. But it is relevant, exciting and new, and most amazingly, done completely by amateur astronomers. Three cheers for three astronomers doing 'citizen science'.